Chef extraordinaire Gina Foxton doesn’t expect anything to be handed to her on a platter. After years of hard work, the former runner-up Miss Teen Vidalia Onion is now the host of her own local Georgia public television show called Fresh Start, and she’s dating the show’s producer. 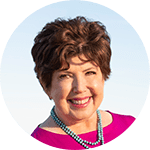 But when her show gets canceled, and she catches her boyfriend in flagrante delicto with the boss’s wife, Gina realizes that she’s meant for bigger and better things. The Cooking Channel is looking for its next star, and Gina is certain that she fits the bill. Trouble is, the execs also have their eye on Mr. “Kill It and Grill It” Tate Moody, the star of a hunting, fishing, and cooking show called Vittles. Tate is the ultimate man’s man, with a dog named Moonpie and a penchant for flannel shirts. Little does Gina know, though, that she and Tate are soon to embark on the cook-off of their lives. Five more days, two shows a day. Ten shows. And the season would be over. She would have two weeks to rest. Two weeks with no makeup. No heels. No cameras. She would let her jaw muscles relax. Not smile for fourteen days. No cooking either, she vowed, knowing immediately that was one promise she couldn’t keep. Right now she might be sick of smiling, sick of staring into a camera, sick of explaining why you had to let a roast rest before carving it, sick of chopping, dicing, slicing and sautéing. But that would pass, she told herself. Just ten more shows. “Not funny,” she said. But it wasn’t Eddie, the overweight, balding veteran of three seasons’ worth of her shows, behind the camera. This cameraman was a kid, with a frizzy shock of blond hair sticking out from under a red bandana worn piratelike, around his forehead. Where was Eddie, she wondered? Were he and Scott in some kind of meeting elsewhere—maybe over at the Georgia Public Broadcasting offices? No. This . . . this smell . . . resembled nothing more than the stink of melting polymer. 1. Why does Scott Zaleski’s infidelity imperil Gina Foxton’s job at Fresh Start? Based on his behavior, how genuine is Scott’s remorse for his actions? 2. How does the strong sibling bond between Gina and Lisa relate to their feelings for their domineering mother, Birdelle? 3. How does D’John accidental sabotage of Gina’s hair enable her to embrace a new self-image? How would you react in a similar scenario? 4. 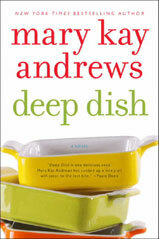 Of the many recipes and dishes described in Deep Dish, which was your favorite and why? 5. What individual roles do Iris and Inez play in manipulating the winner of the Food Fight contest? 6. As an important (if non-verbal) character in Deep Dish, Moonpie plays an important role. What is it? 7. How do the frustrations of filming a reality TV show on a remote island contribute to bringing Gina and Tate together romantically? 8. 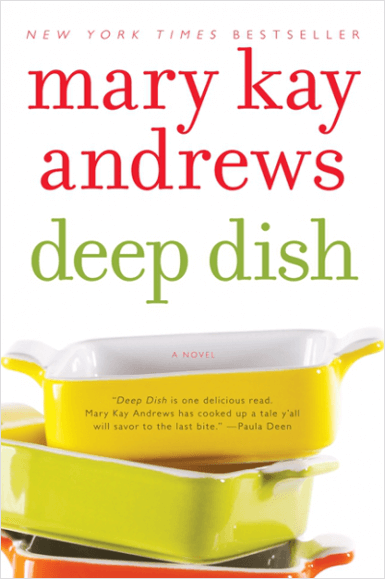 How does the author’s use of humor and satire in the novel impact your appreciation of the plot of Deep Dish? 9. To what extent does Gina’s inability to commit to Tate seem grounded in her own insecurities? 10. What does Tate’s willingness to wait for Gina to come around and recognize his love for her and her own feelings for him reveal about his character?